This double berry apple crisp is packed full of fresh strawberries, blueberries and apples. 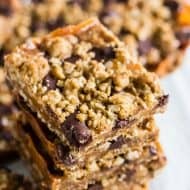 It’s perfectly sweet and topped with a brown sugar oat crisp. Growing up I was a huge apple fan. My dad would buy big bags of apples and he and I would polish off the bag in just a few days. Normally he would buy red delicious which I actually thought were delicious until I tried other more fantastic apple varieties. Seriously, what was I thinking? Red freaking delicious. Yeah, not so delicious. The awesome folks over at Envy Apples sent me a massive box of Envy apples that I polished off in no time. They are super sweet, crisp and perfect for midday snacking. Because I’m a fan of spreading the love I also gave a few away. Every single person who tried the apples came back to me and said “I swear that was the best apple I have ever had!” Yeah, they are pretty amazing. Now this crisp is a pretty basic recipe but the combination of all three fruits totally pushes it over the edge of ordinary. Plus I topped that sucker with lots of creamy vanilla ice cream. Is there anything better than warm fruit crisp topped with cold vanilla ice cream? Looking for more delicious crisp recipes? Try my caramel apple crisp pizza, frozen cherry crisp, vanilla sugar peach crisp, vanilla bean apple crisp, strawberry rhubarb crisp, pear crisp with vanilla brown butter or my slow cooker fruit crisp. This double berry apple crisp is packed full of fresh strawberries, blueberries and apples. It's perfectly sweet and topped with a brown sugar oat crisp. In a medium sized mixing bowl add all ingredients together and stir to combine. Pour into a 9x9 baking dish, cover with topping and bake for about 40 minutes until the top is browned and the fruit is bubbly. In a small bowl stir together all ingredients until combined and crumbly. Note: You can also bake your crisp in 4 larger ramekin dishes instead of a 9x9 dish if desired. Disclosure: I was provided free apples and monetary compensation for creating this recipe. All opinions and thoughts are 100% my own. LOVE this. I am so ready for summer to end and September to start… bring on apple season!! This is so my kind of recipe! I love apples, but overlook them in the summer. Good to know there’s an in season option! Grilled Aplle Turkey Burgers look fabulous. I love fall apple seaso and this is a great summer preview. This looks like an amazing crisp. I’ve never heard of Envy apples. Thanks for introducing me. Nothing beats fruit with a crumbly topping! This looks amazing… especially that crumble topping! Yum! I love a sweet crisp topping, and the combo of fruits here looks lovely. Apple crumble is one of my go-to desserts in the fall, but I rarely make it any other time of year… I’m loving this summery twist with fresh berries, though! I’m also very intrigued by these Envy apples. I don’t think they’re available up here in Canada yet, but I’m definitely going to have to keep my eyes open. It’s been way too long since I’ve made a crisp! Yum! I absolutely LOVE Envy apples and I have been trying to get them for ~ 2 months!!! Apples are probably my favorite food and I enjoy eating them plain or making delicious apple crisps with them!!!!! Talk about an AWESOME giveaway! I love this crisp but I think what’s doing it for me is that topping! Love it! I love the Cilantro Apple Slaw recipe! It is the quintessence of summer and everything hip! It looks pretty, too. 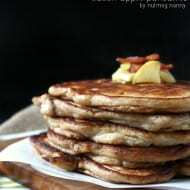 I want to try it soon! The double berry apple crisp looks delicious. 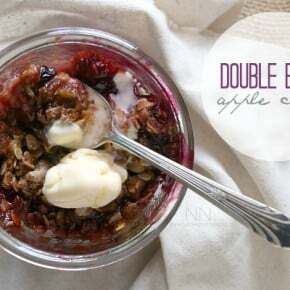 I’m trying this double berry apple crisp for sure. I love trying new varieties of apples – especially the sweet crisp ones! I love the fruit you used here and that give away rocks! I’d like to try the Apple , Sausage and Onion Kebabs. Apple pie ice cream sandwiches sound like a double winner. 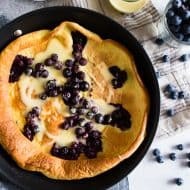 So delicious looking with the burst of color from the berries! Must-try! I’d love to try the apple turkey burgers!! Perfect for summer! Thanks for the amazing giveaway! The pizza sounds so good. I am off to see the recipe. It doesn’t get any than this! Looks great! Apple crisp — and all its variations — has to be one of my absolute favorite desserts. This one looks soooo good. The double berry apple crisp just is calling my name. I love the idea of the berries and apples together and then I think that topping would put it over the top! I love apples all the dang time. The fresh berries mixed in must really make it all pop! I love baking with apples, especially any kind of crumble or crisp. I’m drooling. Apple crisp is usually a fall thing for me, but with those berries this one is definitely good for summer. 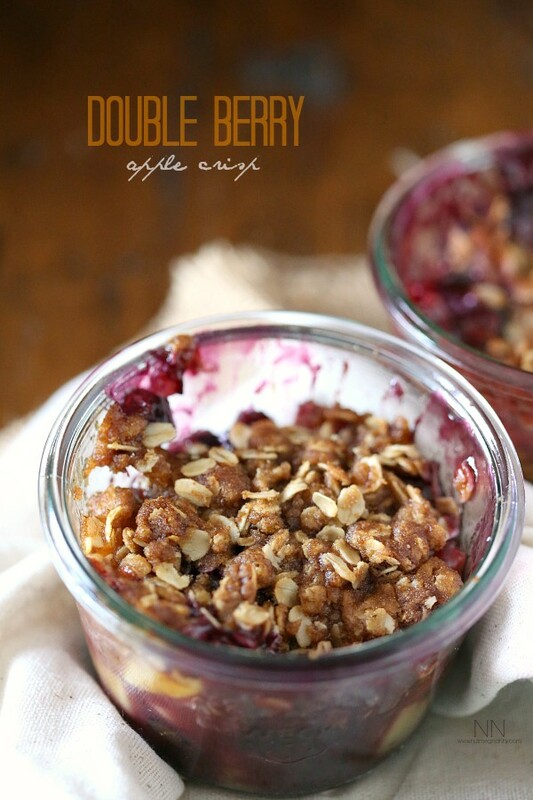 Double apple berry crisp! I love idea of the apple and berry combo. Apple Pie Ice Cream bowls. Yummy!!! I used to be more of a Granny Smith girl but seriously – what was I thinking?! There are so many better apple varieties out there that I didn’t even know existed!! I don’t tend to think to mix apples and berries much, but why not!? Such a fun combination of some of my favorite fruits! please note: I thought I went through the steps of entering about three hours ago. I was using my Mom’s laptop–when I noticed that the RC form didn’t indicate I had completed entries. So, here I am at the desktop. The pin I pinned earlier was on my board and my tweet was visible, too. I hope I haven’t duplicated entries or done anything else to be disqualified. If you can figure out what happened, I’d appreciate your insight. Thank you. I’d love to try the Grilled Apple Turkey Burgers recipe. I have got to try the Double Berry Apple Crisp recipe. It sounds so yummy. Oh I would love to try the Double Berry Apple Crisp! Everything looks so good but the Apple Pie Bites with Caramel Dipping Sauce stuck out to me. Looks delicious! i want the double berry apple crisp… thanks so much!! I’d most like to try the Apple Pie Ice Cream Sandwiches! The Grilled Apple Turkey Burgers sound delicious! Apple Pie Bowls sound awesome! I would most like to try your recipe for apple crisp with berries–maybe serve it with homemade cinnamon ice cream. Yum! I’d really like to try the Grilled Apple Turkey Burgers from Cooking with Books. I love the sound of anything double berry so will have to try this out. I really like apple crisp but haven’t ever combine it with another fruit. Grilled pizza with apple and sausage! I’d like to try the Apple Pie Milkshake. The Double Berry Apple Crisp looks awesome. I would love to try this one! The apple pie milkshake looks like it would be amazing on a hot summer day! It’s a nice collection of recipes, for sure, but the one that catches my eye first is the Apple Pie Bites with Caramel Dipping Sauce (although I confess that I might skip the dipping sauce and just stick with the bites). 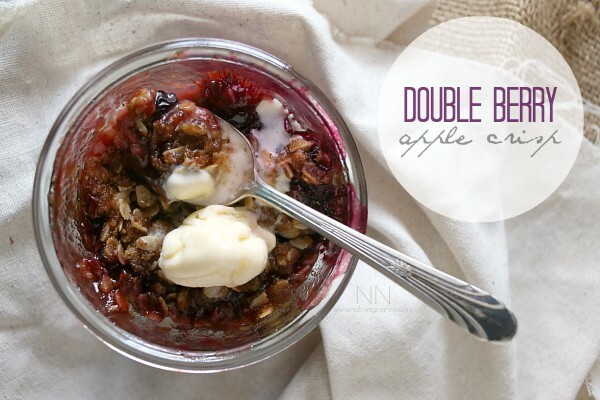 My favorite apple recipe is the Double Berry Apple Crisp. If I am suppose to choose a favorite recipe from the above links, I would choose the Summer Salad with Roasted Envy Apple Vinaigrette. I love the crisp, going to try this one on the weekend! Really like how it is in the mason jars! The Crisp sound really good!! Apple Pie Ice Cream sandwiches.,hmmm! I would love to try the double berry apple crisp. I love, love, love apple crisp but I have never had it with berries and it sounds so yummy! Apple Pie Bites with Caramel Dipping Sauce looks really good right now! The Apple Crisp looks absolutely delicious!